Hartford Holiday Light Fantasia returns in 2017 to Hartford, Connecticut's Goodwin Park (view directions) for the 16th time. The magic of this holiday light show isn't just in the sheer number of glowing bulbs. A drive through this Christmas attraction puts everyone in the holiday spirit, from tiny tots to grandparents. It's an event the entire family can experience together, since the only effort it requires is climbing into a car and turning on the radio. 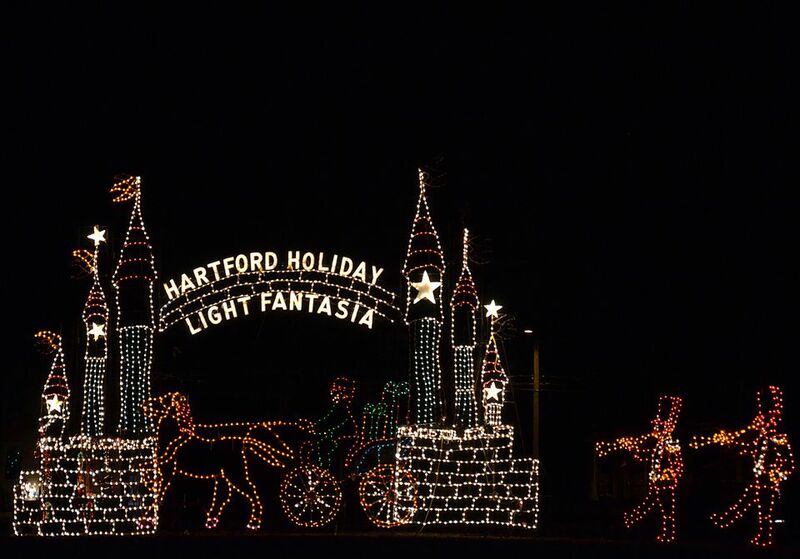 Promoters responsible for the original Hartford Holiday Light Fantasia drive-through display of festive, illuminated scenes claimed that there were one million lights glowing in downtown Hartford, Connecticut's Goodwin Park, and the event has only grown over the years. This two-mile holiday extravaganza is in serious competition with nearby Bright Nights at Forest Park in Springfield, Massachusetts. It also outshines the Holiday Lights show at Bristol, Connecticut's Lake Compounce amusement park, which has been illuminated for the sixth time in 2017 with hundreds of thousands of lights. It's tough to say definitively which is New England's largest holiday light display. What's easy, though, is to suggest that you see at least one of these glittering holiday wonderlands before the season is over! In 1999, Associated Events L.L.C. and many Hartford city and corporate sponsors contributed to the $500,000 transformation of Goodwin Park for the first Hartford Holiday Light Fantasia. After a three-year hiatus, this beloved holiday tradition returned in 2011 thanks to promoter Frank Maratta's generous decision to donate the light displays and equipment to Channel 3 Kids Camp, which uses proceeds from the event's holiday season run to fund year-round programs for children. Among the 200 illuminated spectacles that visitors will see at this light extravaganza are a 30-foot tall Holiday Castle, a gingerbread house and the Statue of Liberty. You'll be mesmerized by the dazzling displays, and, with your radio tuned to the suggested frequency, the holiday music and warm glow of one million lights is sure to make for a fun family outing that might just become an annual tradition. The show runs every night (even Christmas night!) this holiday season from November 23, 2017 through January 1, 2018. Santa will be on hand Friday and Saturday evenings from 5 to 8 p.m. Hours: Sunday through Thursday nights from 5 to 9 p.m. Friday and Saturday nights from 5 to 10 p.m.
Print this online coupon and save $2 per vehicle. Credit cards are accepted, but there is a $0.50 convenience charge. Military Appreciation Night: On December 26, 2017, admission is free for all active and veteran military personnel with proof of service. Proceeds benefit Channel 3 Kids Camp. Call 860-742-2267 for more information. Looking for a Fun, Free Alternative to Holiday Light Fantasia? 2017 is the final year for Lights on Rosewood in Bristol, Connecticut: a homegrown holiday display that will blow you away with its synchronized-to-music lights and feel-good mission. This year, any donations will support two young Bristol boys who are battling cancer. Lights on Rosewood opens for its holiday run on November 24, 2017, and continues nightly through Christmas.